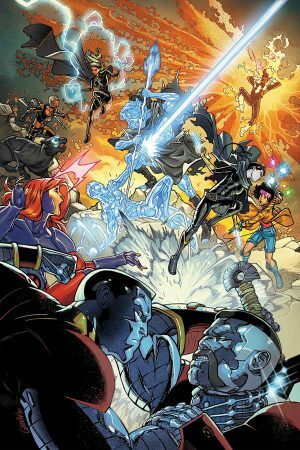 Enter the “Age of X-Man”! From the Munich circus to Hollywood Boulevard, Nightcrawler is starring in his own solo series! Kurt Wagner is the biggest celebrity slash super hero since Dwayne Johnson! Juggling Kurt’s responsibilities as one of the X-Men and a slate of summer blockbusters would be tough without the best support staff in the business: Stunt coordinator Magma! Personal trainer Kylun! And of course, his leading lady Meggan! The perfect heroes for a perfect world! The X-Men have helped make the world into a utopia where living in fear and hatred is a thing of the past. 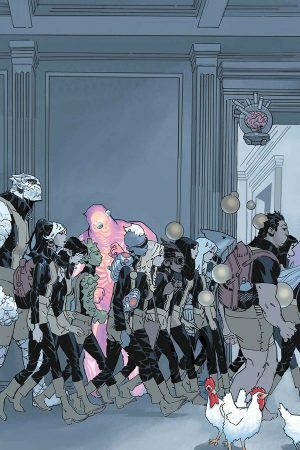 All people are united under the banner of mutantkind, and all of mutantkind idolises the X-Men. Jean Grey! Colossus! Storm! X-23! X-Man! Nature Girl! Magneto! 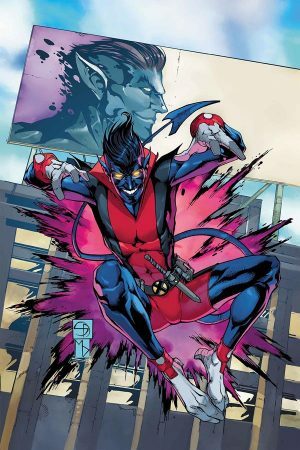 And of course, the amazing Nightcrawler! 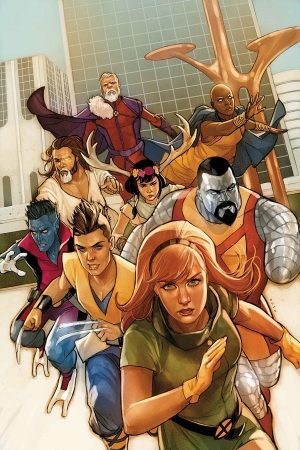 When danger threatens the world, the Marvelous X-Men set things right for the good of all. And no one dares say otherwise. Follow Glob, Armor, Anole and Rockslide as they discover what it really means to live in an age of peace and harmony! A perfect world doesn’t just… happen. It needs to be cultivated. That’s where the X-Tremists come in. 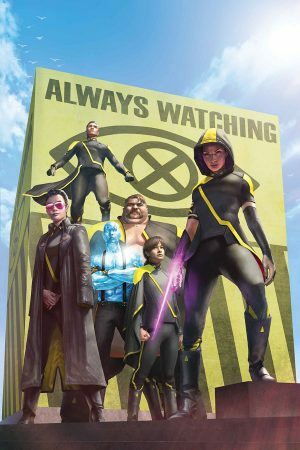 Psylocke, Iceman, Northstar, Blob, Jubilee and Moneta protect people from threats they won’t even know existed, including the most insidious threat of all – love. Night has fallen across the universe. Now seven Avengers — and one new addition — journey forth to bring back the light. But when the threat they face has destroyed even the gods… will anyone make it home? 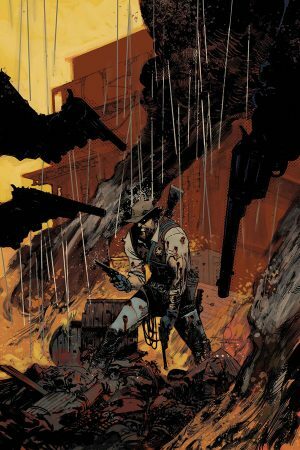 For Marvel’s 80th anniversary we’ve set our sights on bringing some old titles back into the herd, and we’ve brought in Stray Bullets” David and Maria Lapham for a bullet-riddled saga of violence, vengeance and Western justice. In the days of the Old West there were plenty of fearsome folk… cowboys, rustlers, lawmen and outlaws… but few were as fearsome as the Gunhawks! The clash you’ve been waiting for! At last! 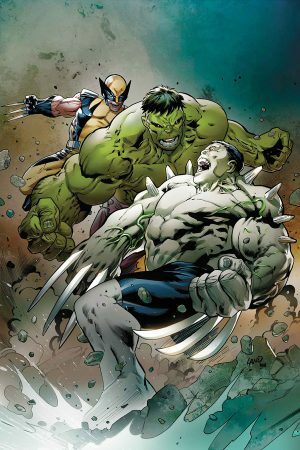 It’s Weapon H versus his predecessors – Wolverine and the Hulk! Once, the Weapon X program sought to recreate the world’s two greatest hunters. They ended up with Weapon H, a man of Adamantium claws and gamma-juiced blood. Now, Wolverine and the Hulk are back in action – and coming after the dangerous creation made in their name! 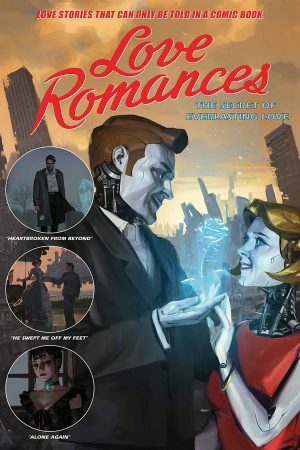 Writers Dennis Hopeless, Gail Simone, Jon Adams and more join a variety of superstar artists including Roge Antonio and Annapaola Martello for Love Romances – love stories that can only be told in a comic book! Is romance just a fantasy? Can love breach the corridor of death? Celebrating the 25th anniversary of the series that changed the way we look at super heroes, the landmark Marvels is back! 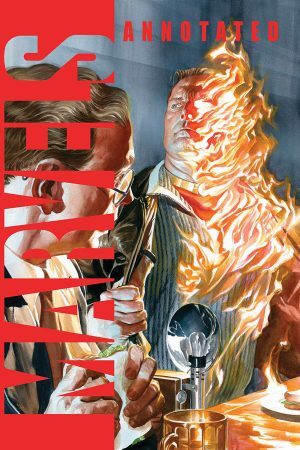 In the year 1939, young photojournalist Phil Sheldon attends the sensational unveiling of the fiery android Human Torch — little knowing he is witnessing the dawn of the Age of Marvels! Prepare to relive Marvel’s Golden Age from a whole new point of view as Phil covers the superhuman sightings of the 1930s and 1940s — from the terror caused by the Human Torch’s epic clash with the Sub-Mariner to the patriotism stirred by the debut of Captain America and more! Packed with extras and completely remastered, you don’t want to miss this unique look back at the Marvels phenomenon! Meet Peter Quill. 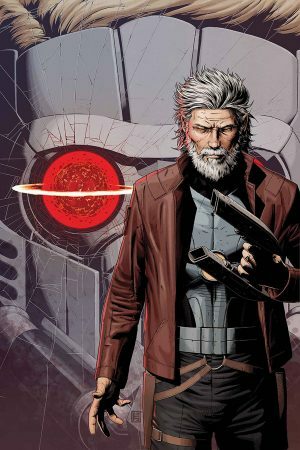 He used to be Star-Lord – you know, the legendary outlaw – but it’s been quite some time since he’s gone by that name. 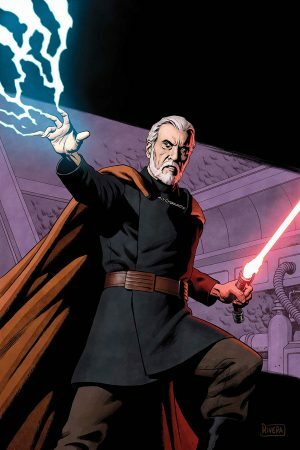 Taking over for his father as the Emperor of Spartax, Quill put the life of space-faring adventure behind him for one of leadership and responsibility. Quill grew up. But things didn’t go as planned. Decades have passed, and Peter is haunted by tragedy. Down and out, Quill’s existence means nothing… until the former Guardians of the Galaxy drag Peter out of his funk for one last mission! The heist of a lifetime – and Quill’s harrowing quest for redemption – begins here! The ancient cult of Koga Thun. A mystical treasure. And the only man who can save the Hyborian Age! Adrift at sea. No food. No weapons. Death surely awaits him. But the lionhearted Conan is not so easily subdued, by Crom! When Conan finds himself captured, he unleashes his might on an unsuspecting pirate crew… one whose dark secrets will plunge Conan on the trail of an ancient treasure that may prove to be his undoing! 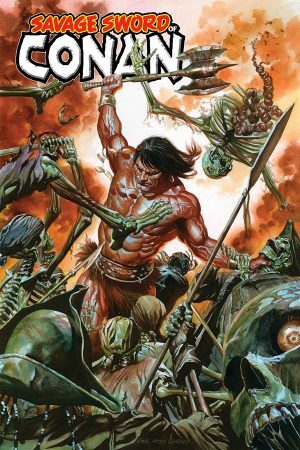 An all-new age of Savage Sword of Conan begins with a five-part tale of swords and sorcery by Gerry Duggan (Deadpool, Infinity Wars) and illustrated by legendary artist Ron Garney (Daredevil, Thor: God of Thunder) with covers by the incomparable Alex Ross, and breathtaking variant covers by Garney, Rahzzah, comics legend George Perez and Teenage Mutant Ninja Turtles co-creator Kevin Eastman! 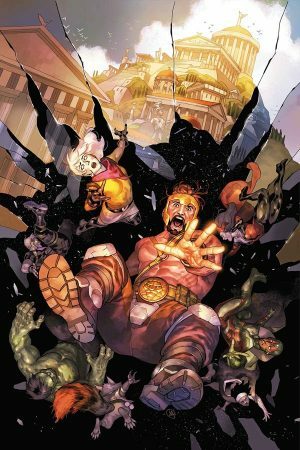 Welcome to the deadly Hyborian Age — hope you survive the experience! Iceman and the X-Men get a special visitor from the future! An older Bobby Drake has come to the present to tell him to give up being a super hero. But what could have happened that would change Bobby Drake from the X-Men’s resident jokester to a morose mutant? The return of Ziggy Pig and Silly Seal! 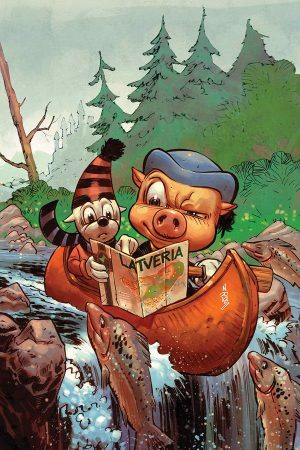 Frank Tieri (Wolverine, Space Punisher) and Jacob Chabot (Marvel Super Hero Adventures) bring back the comedy duo in an all-new adventure. Once they were superstars of the Funny Animal Comedy circuit! Now money and fame have ruined their friendship. Will it ruin their lives? Hero for a day, hero for a planet! 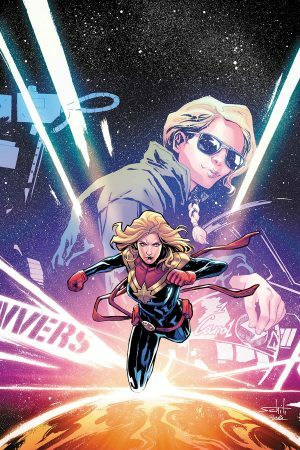 Air Force Pilot Carol Danvers is a hero to many… so what could possibly delay her to her own celebration? Only her other job – as Earth’s Mightiest Hero, Captain Marvel! 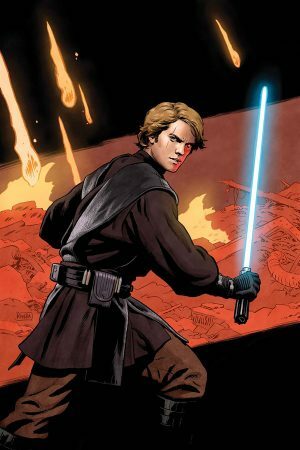 Stuck between her duty to her community and her responsibility to the wider world, Carol will have to make a tough decision, and muster all of her power to fend off an invasion force! Don’t miss the excitement of the strongest and mightiest hero of all in her latest adventure! 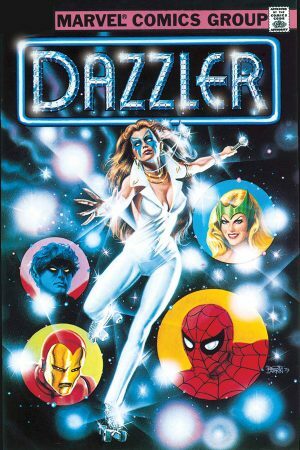 She’s a singer, not a fighter — but Dazzler was always destined to be one of comics’ brightest stars! Journey back to the days of disco to join Spider-Man, the Avengers and the X-Men in welcoming Alison Blaire to the Mighty Marvel firmament with this impeccable facsimile of the first issue of Dazzler’s sparkling solo series! Alison’s mutant powers place her at a career crossroads. Can she be a singing sensation? A stellar super hero? Or both? But when Alison dons her iconic roller skates to make an important audition, will she dazzle everyone — or will the Asgardian Enchantress steal the show?! It’s a landmark issue of the 1980s, re-presented in its original form, ads and all! Relive exciting espionage adventures alongside the Black Widow and celebrate Marvel’s 80th anniversary with the return of Marvel Tales! 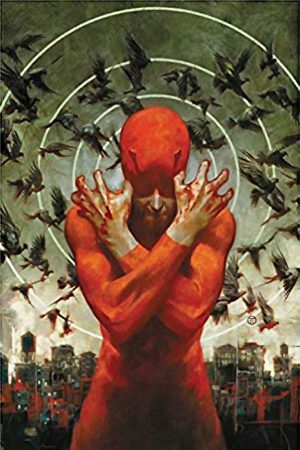 This anthology series shines a spotlight on fan-favourite characters, features timeless stories and highlights some of Marvel’s most impressive talent from the past eight decades. 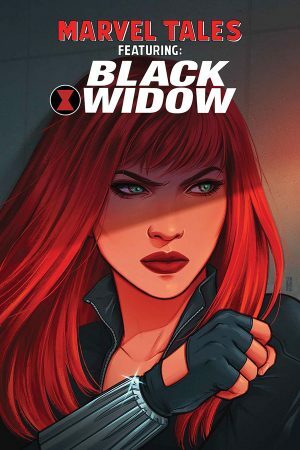 Featuring the debut of the Golden Age Black Widow from Mystic Comics (1940) #4, the first appearance of the incomparable Natasha Romanoff as a femme fatale targeting Iron Man in Tales Of Suspense (1959) #52 and the dazzling introduction of Natasha’s iconic modern look in Amazing Spider-Man (1963) #86! Plus, criminals everywhere will feel the Widow’s bite when she goes solo in Amazing Adventures (1970) #1, and Natasha undertakes a superspy mission in Marvel Fanfare (1982) #10. And meet an all-new undercover agent in Red Widow: First Strike #1! 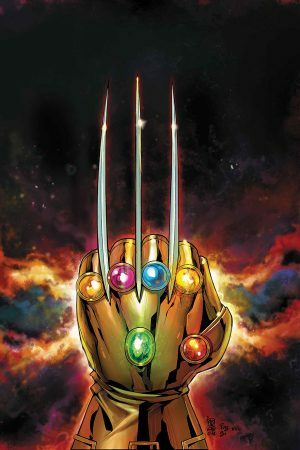 Wolverine has finally returned, disentwined from the evil clutches of Soteira… but hang on, didn’t he have an Infinity Stone? How did that happen?! And wasn’t he popping up all over the place for a little while? The answers you seek are finally revealed as Logan goes cosmic alongside everyone’s favourite god of lies and stories, Loki Laufeyson!